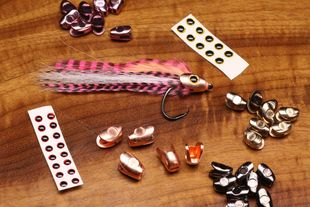 The Caddis Fly Shop serves up a dazzling array of fly tying beads, cones, eyes, and fly tying barbells, shipped promptly. 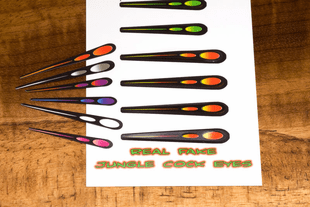 Our selection of fly tying beads, fly tying cones, coneheads and and fly tying eyes of various kinds for fly tying is as extensive as our selection of fly tying supplies, fly tying materials, fly tying hackle feathers, fly tying kits, and fly tying hackle feathers - it is fantastic. 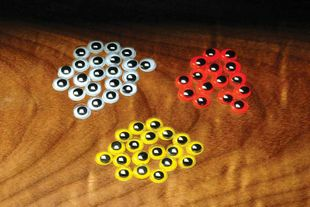 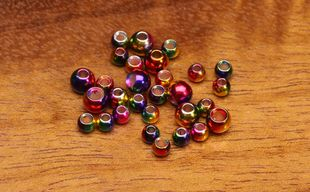 Fly tying beads. 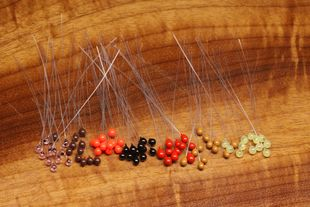 Our fly tying bench would seem practically naked without a solid selection of fly tying beads for our nymphs. 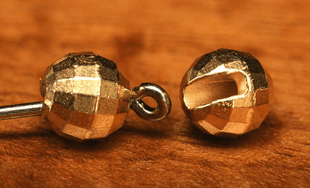 Brass fly tying beads add a glint of come hither to our flies. 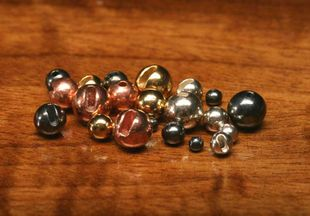 Tungsten fly tying beads beads get our nymphs down faster than brass fly tying beads. 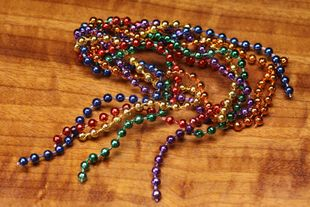 Hot beads in Fl. 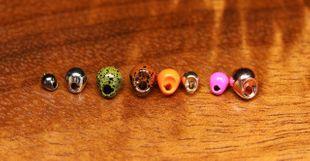 Orange, pink, or chartreuse say hello Mr. fish! 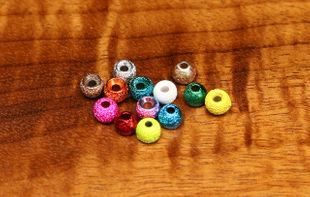 Glass fly tying beads add amazing sparkle and just a tiny bit of weight to our midges. 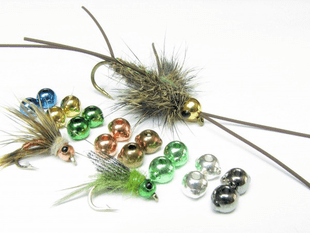 Leeches, and emerger flies. 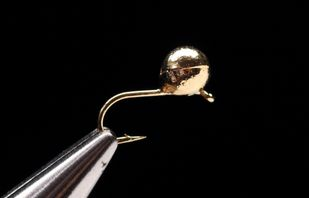 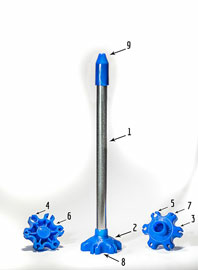 We have fly tying beads with slotted heads to make it easier to slip the bead over the hook barb and around the bend. 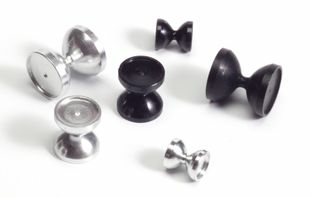 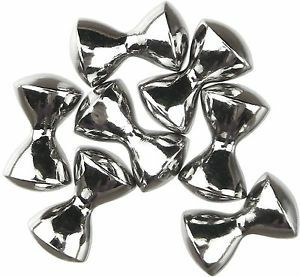 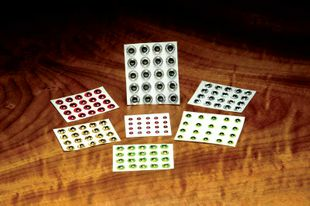 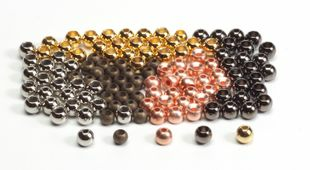 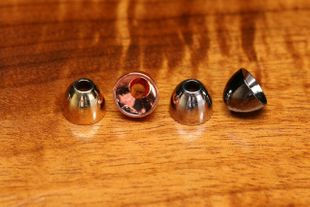 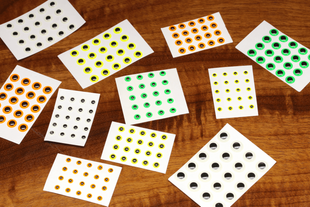 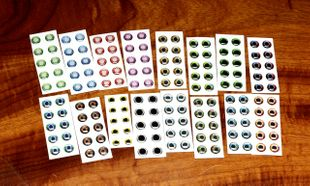 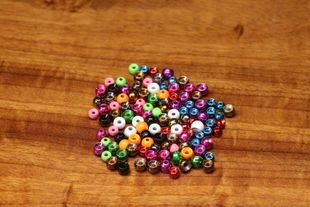 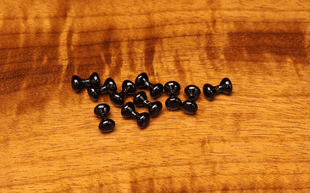 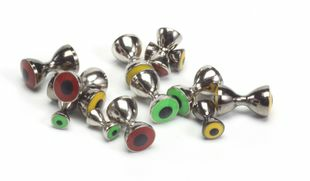 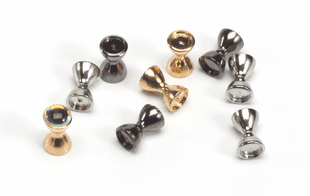 We have painted tungsten counter-sunk fly tying beads! 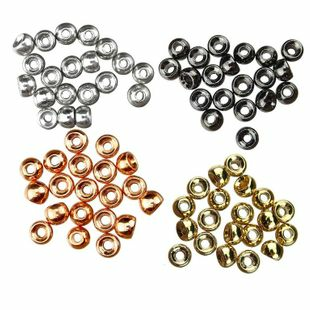 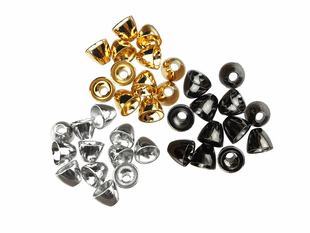 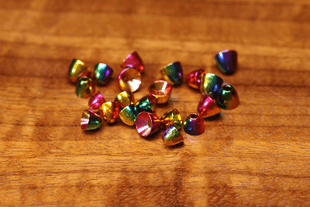 We even carry fly tying beads that are faceted to add sparkle and also have the slots to make application to the fly tying hook easier. 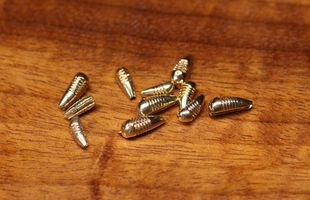 Fly tying cones (cone heads). 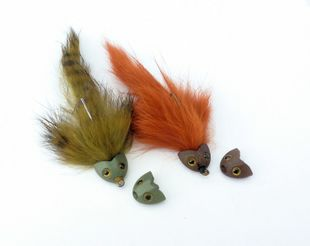 These gracefully tapered fly tying cones and coneheads make a great addition to our Wooly Buggers, Egg Sucking Leeches, Zonkers, Streamers, and all sorts of traditional salmon, steelhead, and trout flies. 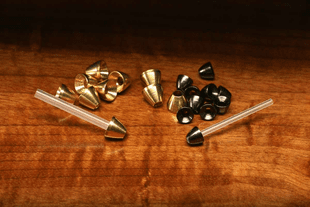 Our fly tying cones and coneheads are available as brass cone heads, tungsten cone heads, hot color cone heads, black coneheads, slotted cone heads, and we even carry cones specifically sized for use on cone head tube flies. 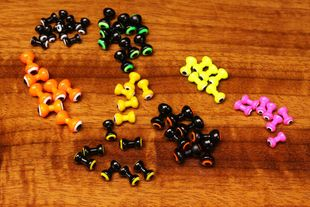 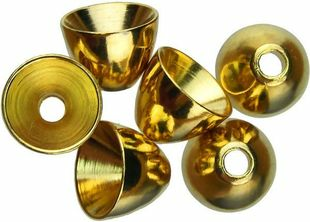 Our fly tying cones represent every color from gold to black, hot colors like Fl. 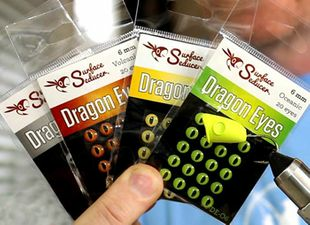 orange and chartreuse, and sizes to fit most of the typical hooks one would use for a cone-head streamer, nymph, pike, musky, or salmon/steelhead fly. 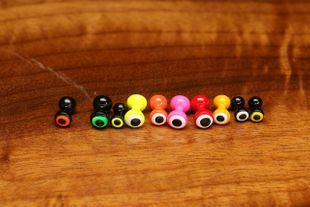 Fly Tying eyes. 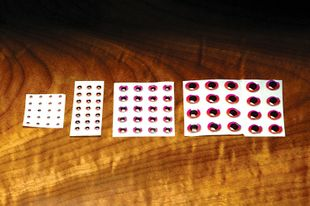 Lets start with our Hareline Pseudo Eyes. 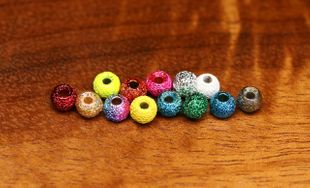 These are amazing little fly tying gems. 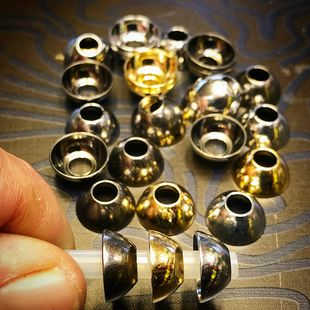 Machined out of brass with the pupils already confused, these are easy to tie with, add the eye catching attraction to our streamers, Intruders, Clousers, and Comets, and are rock solid. 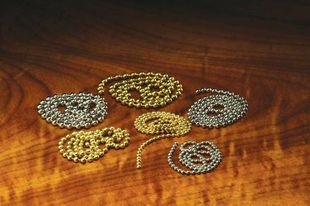 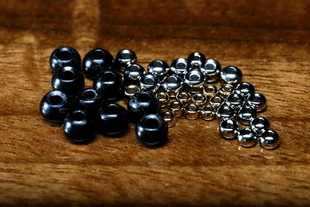 For the traditionalist, we stock a wider carry of fly tying bead chain in nickel. 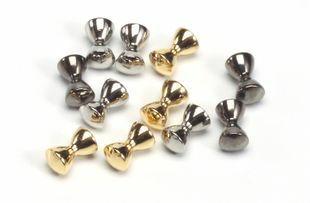 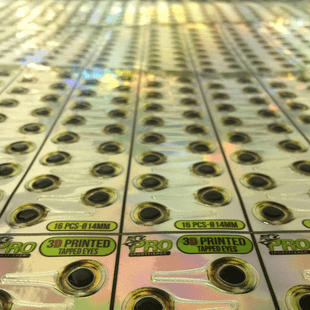 Black, gold, stainless, and fluorescent colors too. 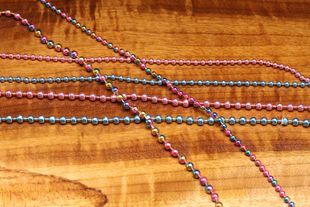 Chinook salmon flies we have the fly tying bead chain. 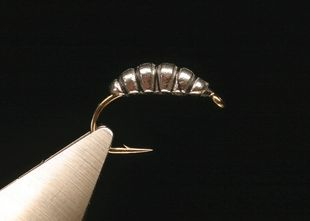 Flats flies we have the right size bead-chain to achieve the proper sink rate. 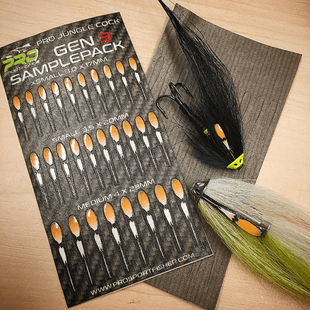 Then we get back to our roots in the lead eyes for fly tying from un-painted, chrome plated, and nicely painted barbells dress up, or tone down our flies; and we have the teeny tiny barbells right up to the giant mondo heavy ones a person could use on a Jig Hook. 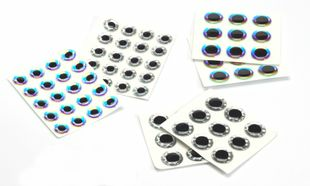 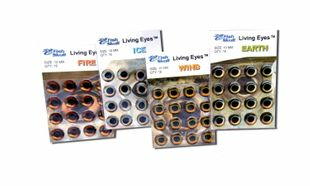 Finally, we also stock tungsten Hour glass (barbell) eyes for fly tying that give maximum size-for-size sink rates and the ability to super glue pupils on the ends. 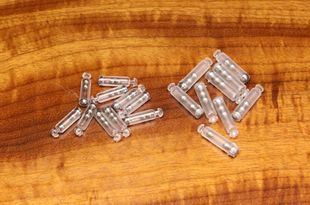 Ooops. 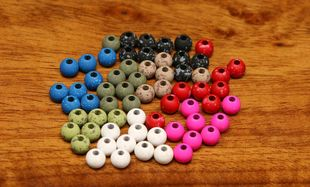 Almost forgot to mention the Hareline Aluminum Sea Eyes for tying big ocean fishing flies. 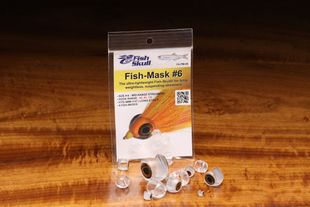 These are BIG but not heavy, the perfect combination for constructing baitfish patterns with big eyes but not too much weight. 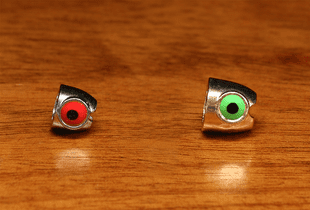 These Aluminum eyes should be finished with glued pupils, and they really make nice fish catching flies for saltwater and big predaceous freshwater fish like bass, pike, musky, and Taimen. 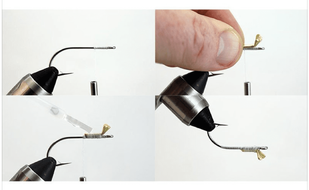 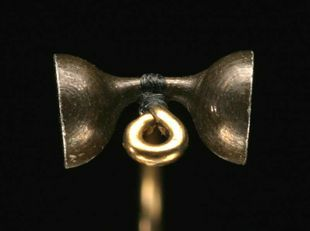 Regarding choosing the right size fly tying bead or fly tying cone to fit a hook. 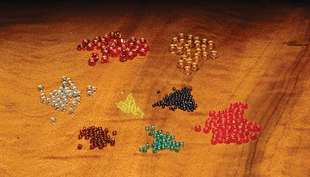 We provide a fly tying bead size chart below, with a word of caution. 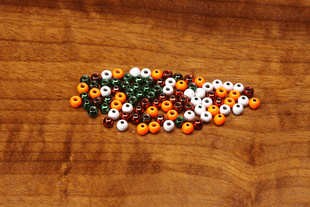 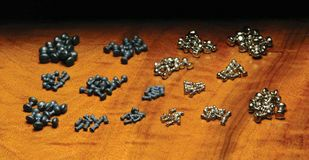 Our fly tying experts find that there is some variation in the size of fly tying beads and fly tying cones that will fit over specific fly tying hooks. 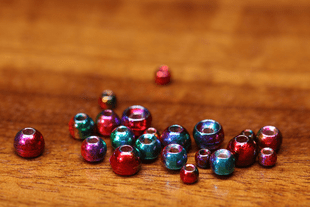 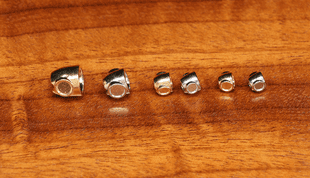 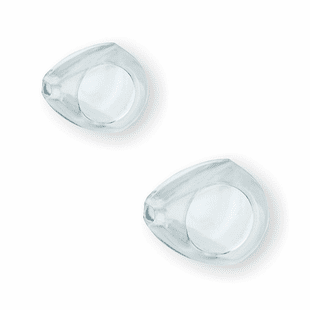 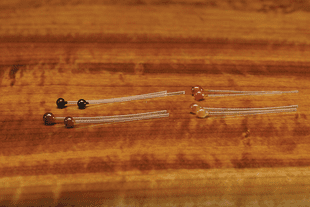 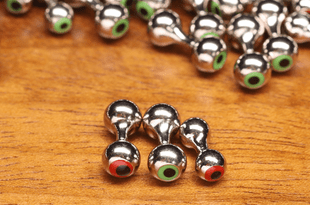 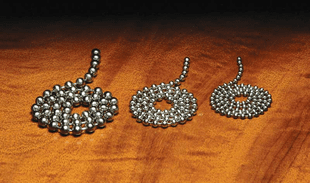 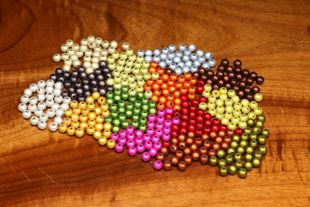 The bead size chart is just a loose guide we provide here as a rough estimate. 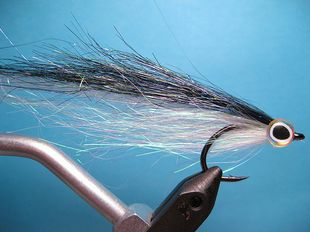 That said, there is nothing quite like holding a fly tying bead in one hand, a fly hook in the other, and trying to jam the little sweetie onto the hook, passing over the barb and around the hook bend. 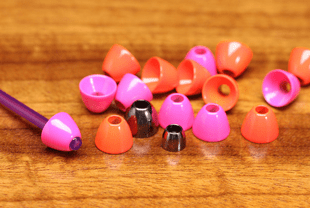 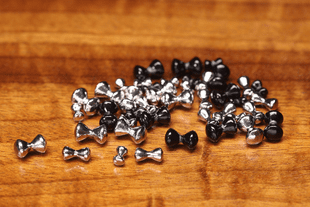 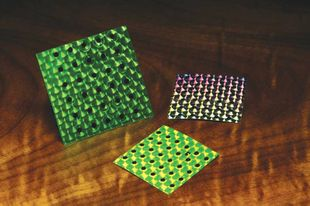 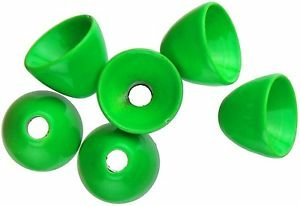 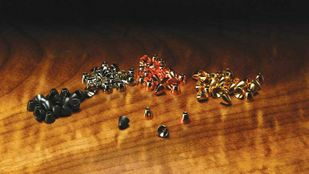 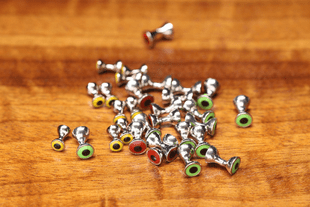 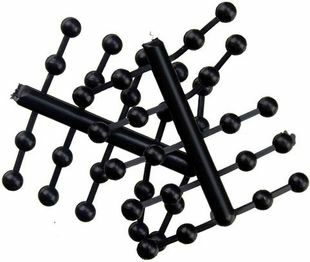 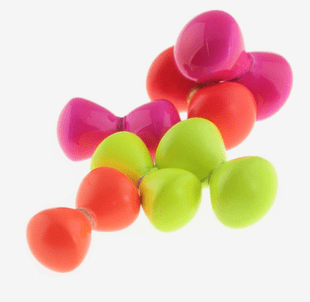 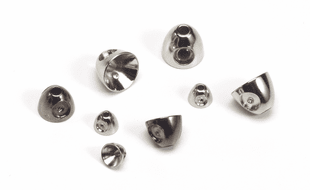 Some trial and error is required here, and we have found that the slotted fly tying beads and fly tying cones and coneheads greatly expands the fit range of any specific fly tying bead or fly tying cone.